It’s been just over eight months since Mackenzie Scott (aka Torres) released her sophomore album Sprinter, and I’m fairly certain she hasn’t left the road since then. At the very least, as of this past weekend she’s played three shows in Chicago over that time period – easily more than most non-local artists. I’d argue it’s the town that keeps drawing her back, but exceptional circumstances such as a tour opening for Garbage likely brought her back sooner than anticipated. This particular time she was asked to return for the Tomorrow Never Knows festival, a multi-day, multi-venue event focused on raising the profiles of up-and-coming bands/musicians. This is also known as “something for Chicagoans to do in the dead of winter when concert season is slow.” For the record, it’s a great way to pass the time with plenty of great live music. 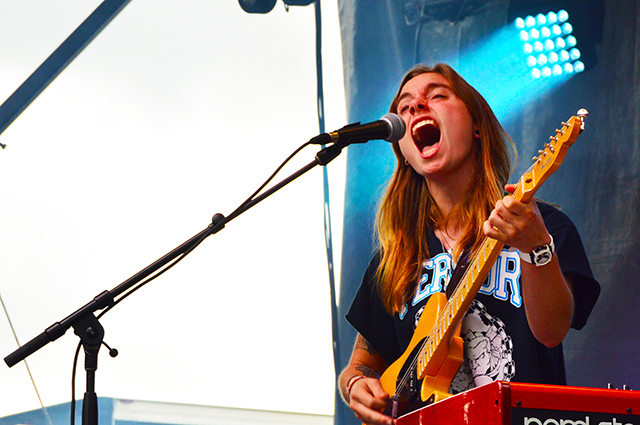 The triple bill of Torres, Palehound and Julien Baker is just a small testament to that, as all three left a sharp impression on 2015 with highly personal, emotionally devastating albums. It made me concerned I’d be walking out of Lincoln Hall on Friday night a shell of a human being, my insides shredded from so much anguish. Thankfully that wasn’t entirely the case. 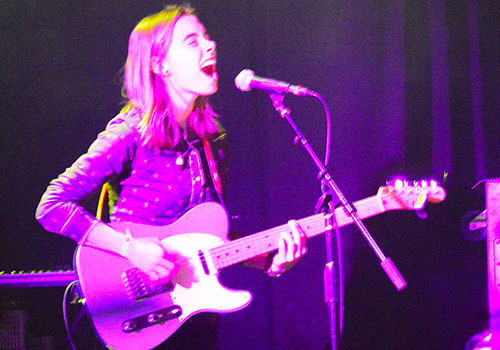 The night began with an opening solo set from Julien Baker. Her debut album Sprained Ankle earned her a place on many “Best of” lists last year, with special attention paid to her powerful and raw lyrics delivered with the nuance of a strong gut punch. In a stunning six song set, Baker wrenched every bit of emotion from each moment. The packed room stood in hushed silence as the weight and beauty slowly became too much to bear. It was an incredibly compelling example of how a performer can fully connect with an audience and even drive a few to tears. My own eyes began to well up towards the end, and that’s a rarity. The 19-year-old Baker is undoubtedly a talent worth following with a long career ahead of her. This was her first-ever show in Chicago, and judging by how many people bought her record at the end of the night, it certainly won’t be her last. After the delicate sadness that was Julien Baker’s set, it seemed like Palehound wanted to deal with serious emotional fallout in a completely different way. Very few of their songs could be considered delicate, instead opting for a much darker, angrier tone spiked with heavier ’90s style grunge guitars in the vein of Hole or (most accurately) Speedy Ortiz. Ellen Kempner doesn’t take relationships lightly, so getting emotionally wounded after a break-up fosters aggression and resentment rather than clear-cut sadness and depression. That’s what the record Dry Food is all about, and it hits hard. So too does the band’s live show. While Kempner played a few songs solo with just her and an electric guitar, a majority of the time she was joined by a bassist and drummer who helped flesh out many of the songs and give those wounds an extra little twist of the knife. The trio dynamic also allowed Kempner to take some sonic detours on songs like “Easy” and “Molly” with some solos that really gave the crowd a taste of her profoundly excellent guitar skills. While it certainly left me impressed in the first half of the set, things calmed down a bit towards the end, which would’ve been disappointing if this alternate side wasn’t equally as compelling. At one point we were treated to a new song she hadn’t played live before, taking care to note that it was written more recently when someone new had come into her life and changed her outlook in a more positive direction. 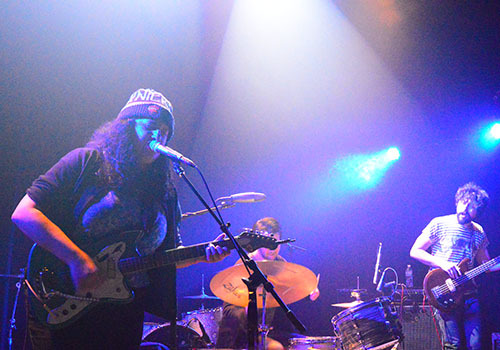 It was just about the only love song that would be played all evening, and offered a glimpse into where Palehound might be headed next. No matter how things progress in terms of content or subject matter, the band made it pretty clear on Friday night that they are highly talented and a force to be reckoned with now and in the future. Don’t be surprised if you hear plenty about them in 2016 and beyond. The biggest benefit of touring incessantly is that you develop a much stronger stage presence. That is to say you learn what works and what doesn’t to help create the best, most entertaining and engaging version of your live show as possible. Given that Mackenzie Scott spent a majority of her time on the road in 2015, it makes perfect sense that she’s all the better performer because of it. When I caught her last May, it was mere weeks after the release of Sprinter and there were clear indications she was still feeling things out a bit with the new songs. These are growing pains every artist goes through, and some handle it much better than others. 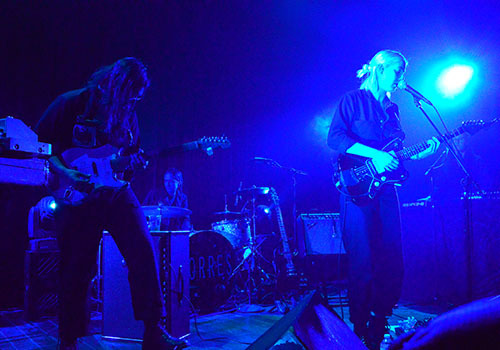 In the case of Torres, eight months ago she sounded great and put on a confident, strong show, but a few small things like the set list could have used some adjustment. Specifically, the overall pacing was a little off, and there were a few moments when it felt like Scott was holding back just a bit. For all I know it could have been the circumstances of that particular day, mixing things up on tour for the sake of variety. No matter the factors, by all accounts the set on Friday at Lincoln Hall represented an increase in consistency and showmanship. The somewhat ironic thing is that the set list was nearly the same as the previous Torres show last May, just the order of the songs had changed slightly. That served well to even everything out and create a clearer path from start to finish. From the slow burn opening salvos of “Mother Earth, father God” through the clawing descent of “The Harshest Light,” the nine song set felt very much like a journey into and out of darkness. The 1-2-3 punch of “New Skin,” Cowboy Guilt” and “Sprinter” slammed with the force and subtlety of a wrecking ball, leaving destruction and devastation in its wake. 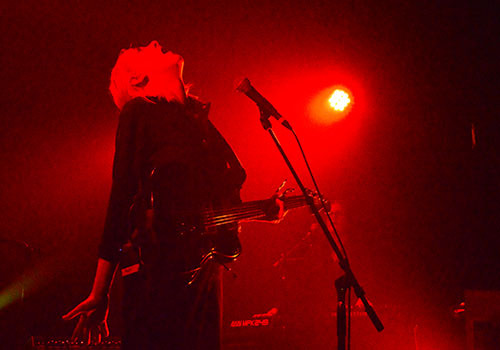 The weight of these songs also physically manifested itself through Scott’s body as she visibly trembled during the more intense moments of the set. This was particularly prominent during the back-to-back combination of “Son, You Are No Island” and “Strange Hellos,” the former of which was all underlying dread and the latter of which was all powerful, fiery release. For those few loudly punctuated minutes, everyone in the room was rapt with attention as the walls were painted with sheer ferocity and self-confidence. This was Torres at her most vital, suddenly coming into focus and finding her footing after wandering around lost in the darkness. 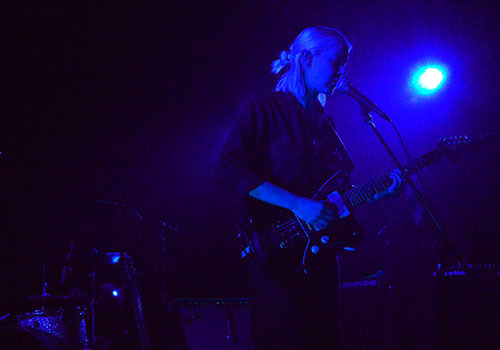 Such a captivating catharsis contributed to what was the best Torres show I’ve seen to date. Can’t wait for the next one.